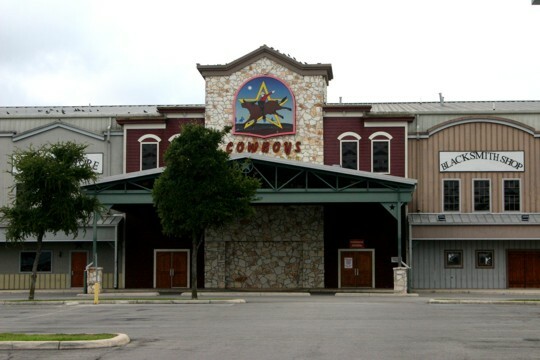 Cowboys Dancehall is a 70,000 square foot state of the art entertainment complex that offers a variety of entertaining options for groups of 50 to 4,000! With two levels, two dance floors and a 20,000 square foot indoor rodeo arena the options are endless! We also accommodate any of your multi-media needs- our seven theater size screens and twenty 42” plasmas are just the beginning of what our in-house professional production staff can offer you and your guests! The entire facility is available for private events Sundays, Mondays, and Tuesdays, all day long and Wednesday – Saturday until 8:00 PM when we open to the public for normal business. “Las Vegas” style performance stage, capable of multi-level positioning. The stage backdrop continues the “old western town” storefront façade matching the building’s exterior architecture. 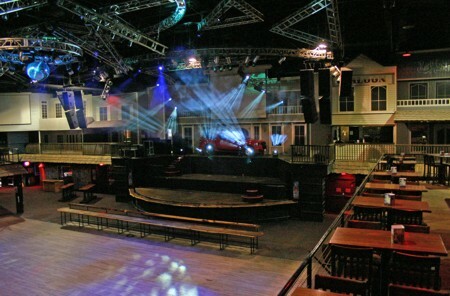 Fronting the stage is the Texas-sized dance floor, which is flanked on three sides by bar rails and seating. Bars and beerwells servicing the main music and dancing area are strategically located throughout the ground floor. Rest rooms are located in two of the floor’s four corners. The General Store and Coat Check are located near the front entrance. 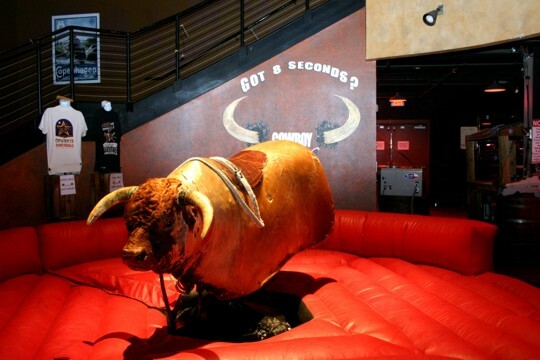 The Mechanical Bull is stationed in the middle of a spiral staircase, so spectators can gather around the staircase and look down upon the rider. Still on the ground floor, but visually separate from the Main Stage are the indoor rodeo arena and grandstands. The mezzanine level of Cowboys is all about “the view.” The seating around the perimeters of the ground level dance floor allow the guests to get an overall picture of the club. The projection screens and video monitors enhance their experience with optimum viewing of the performance area. The mezzanine level also provides a balcony, showcasing the rodeo arena, and a spiral staircase overlooking the mechanical bullpen. With three bars and its own dance floor, a gaming area complete with billiards and more, as well as food service and catering areas, the mezzanine level is the perfect setting for special events and private parties. The price includes exclusive use of the facility, multi-media equipment, basic staffing (DJ, barbacks bussers, security, etc.) and cleaning. The price includes exclusive use of the upstairs area, equipment and basic staffing. This level is generally offered for private parties during the time of normal business hours when we are open to the public. Upstairs capacity is 1,500 people.